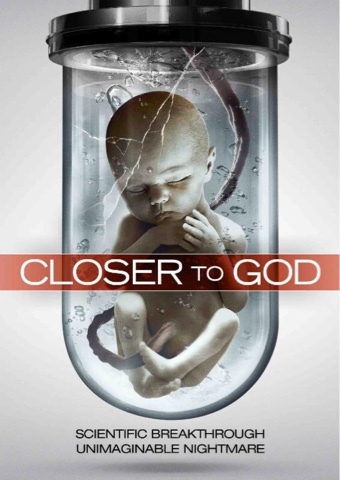 Uncork'd Entertainment and Breaking Glass Pictures will release the acclaimed CLOSER TO GOD, a hauntingly chilling and provocative sci-fi horror that's equal parts David Cronenberg and Mary Shelley, in theaters and VOD July 3, 2015. In writer/director Billy Senese's "ambitious, thoughtful and provocative take on the Frankenstein story" (ScreenDaily), a scientist on the cutting edge clones the first person but events unravel when news leaks out before his team is prepared. The "mind-blowing, thought-provoking, disturbing and brilliant film" (Talent Monthly) played to thrilled, captivated festival audiences in recent months. Starting July 3, CLOSER TO GOD will be available on the following VOD platforms: iTunes, Amazon Instant, Vudu, Google Play, Xbox, iNDEMAND, Vubiquity. Synopsis : Dr. Victor Reed is a brilliant geneticist who has just achieved a huge scientific breakthrough by successfully cloning the first human being, an adorable baby girl named Elizabeth. This immediately becomes a media spectacle and ignites a firestorm of debate concerning the moral and religious implications of such a discovery. Soon, Dr. Reed and his family lose all sense of privacy and safety as they are swarmed by protesters and the media. Their biggest threat, however, could be Victor's own secret.